MONTPELIER, Vt. – The Vermont Fish & Wildlife Department will be hosting seven free hunting seminars that will be helpful for hunters who have some experience as well as for beginners. Participants are urged to bring a lunch for the day-long seminars and dress for the weather, as these seminars have an outdoor portion to them and will be held rain or shine. Space is limited, and they fill up quickly, so signup as early as possible at www.vtfishandwildlife.com and clicking on the seminar portion of the Hunter Education page. For more information, call John Pellegrini at 802-793-1894. Predator Hunting, August 22 from 6:00 to 9:00 p.m. at Pelkey’s Archery Shop, 275 Nason St., Saint Albans, VT. Erik Hammond leads this workshop on hunting predators with emphasis on coyote. The seminar will cover game calls, setup and related helpful information. Hunting Vermont Black Bears, August 25 from 9:00 a.m. to 3:00 p.m. at Linwood Smith’s Archery Shop, 281 Old Bradley Road, St. Johnsbury, VT. This seminar covers basic bear biology, successfully hunting bears and processing bear meat. Instructors will be Vermont Fish & Wildlife bear biologist Forrest Hammond and bear hunter Jim Roy. 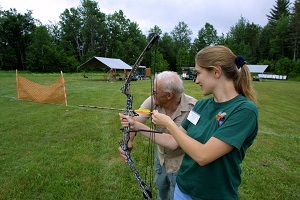 Introduction to Bow Hunting, September 5 from 6:00 to 9:00 p.m. at Linwood Smith’s Archery Shop, 281 Old Bradley Road, St. Johnsbury, VT. This seminar will teach the beginning bow hunter how to become more successful in the field and cover stand placement, use of camo, how to properly fit and tune your bow, and more. Linwood Smith and Jeff Houde will be the instructors. Hunting with Primitive Firearms, September 9 from 10:00 a.m. to 2:00 p.m. at Precision Valley Fish and Game Club, 2879 Route 106, Perkinsville, VT. This seminar covers several types of primitive firearms. Richard Odette is a Hunter Education Instructor who is an expert in primitive firearms. There will be a field portion of this seminar during which participants will be shooting. Deer Processing, September 19 from 6:00 to 9:00 p.m. at Mountain Deer Taxidermy, Northfield, VT. This seminar will feature Rodney and Theresa Elmer. They will teach the skill of field dressing, processing and preparing a deer for taxidermy. Squirrel Hunting, September 22 from 9:00 a.m. to 3:00 p.m. at Hale Mountain Fish and Game Club. Craig Botessi leads this intriguing workshop on hunting the elusive gray squirrel. Cooking recipes will also be shared in this seminar. Deer Tracking, October 17 from 6:00 to 9:00 p.m. at Mountain Deer Taxidermy, Northfield Vt. Rodney Elmer will lead this popular seminar. Topics covered will be habitat, clothing required and successful methods of tracking a deer. Reasonable accommodations for persons with disabilities are available upon request. Please include a description of the accommodation you will need. Individuals making such requests must include their contact information. Please send an e-mail to: Catherine.Gjessing@Vermont.Gov or call the office staff at 802-828-1000 (voice), 1-800-253-0191 (TTY).